While probably not worth the upgrade for Dropcam Pro owners, Nest's first security camera is great option for first-time home monitors. Nest ­launched its first security camera, the Nest Cam, earlier this year. Essentially a sleeker version of the Dropcam Pro—which the Alphabet-owned company acquired when it bought Dropcam last year—the Nest Cam also brings a few improvements, including sharper video, enhanced night vision, and better sound and motion detection for the same $200 price. The most immediately noticeable difference from the Dropcam Pro is that Nest Cam looks and feels like a more quality product. A new swivel joint gives you a lot more flexibility for choosing viewing angles, and its magnetic base similarly provides many more mounting options. It also comes with a wall mount and screws for more secure and permanent placement. As an extra security measure, there are no buttons on the camera itself; all functions are controlled from the Nest app. While Nest Cam provides the same a 130-degree wide-angle view as Dropcam, it streams in 1080p—a bump from Dropcam’s 720p—at 30 frames per second. Eight infrared LEDs ringed around its lens deliver enhanced night vision, and an integrated mic and speaker enable two-way communication. Once it’s setup, Nest Cam scans the environment to get a baseline of the room when it’s still. 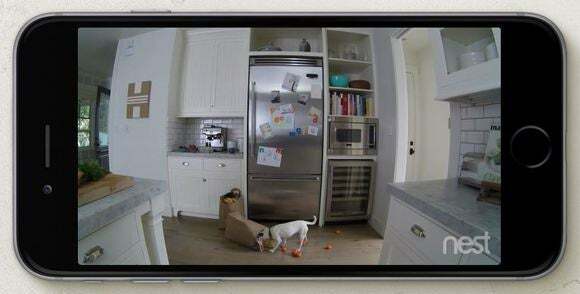 Once you enable motion alerts, the camera’s built-in sensors trigger the camera to record video of the scene and push notifications to your mobile device if it picks up a door opening, a body passing in front of the camera, or other movement. If you enable audio alerts as well, Nest Cam will respond similarly when it detects sounds above the ambient noise level of the room. 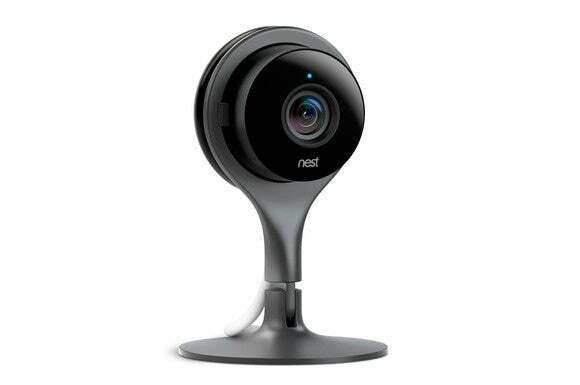 With 1080p video streams, the Nest Cam delivers higher resolution than many of its competitors. One crucial difference between Nest Cam and some other cameras we reviewed is that it must be plugged in to an outlet at all times—Nest Cam does not have battery backup. That’s significant, because if the electricity goes out or an enterprising burglar cuts the power to your home, the camera stops working. You get free access to live video out of the box, but you’ll need to pony up for a Nest Aware with Video History subscription to take advantage of all Nest Cam has to offer. You can sign up for either a 10- or 30-day cloud-stored Video History plan (for ($10 per month or $100 year; $30 per month or $300 per year respectively), which will let you review past recordings for the selected term. Either subscription will also let you create and share video clips, condense a day of video into a 30-second time lapse, get advanced motion alerts that reduce false alarms, and create Activity Zones to keep a closer eye on designated areas. You get a free 30-day Nest aware trial when you purchase a Nest Cam; it starts as soon as you add the camera to your Nest account. Nest Cam offers two painless setup options: via the Nest app on a Bluetooth LE-capable smartphone or tablet, or through the Nest website on a Mac or Windows computer. Using the app method, you’ll be required to scan the QR code on the back of the Nest Cam with your device; you’ll need to connect the camera to your computer via USB cable to do the website setup. In either case, the Nest setup wizard walks you through the process of adding the camera to your Nest account and connecting to your home Wi-Fi network. Whereas most of the other security cameras in our guide seem designed to blend in with your home’s furnishings, Nest Cam’s all-seeing eye peered conspicuously from wherever I placed it, but perhaps that makes it more of a deterrent to bad behavior, whether by unsupervised children or intruders. The Nest Cam maintained a strong connection to my Wi-Fi network, even when I moved it to an upstairs bedroom (our router is downstairs). Video was crystal clear, even with night vision turned on, and there was only moderate fish-eye distortion at the edges, usually when I placed it in a smaller room where it had a shorter focal length. A slightly upgraded Dropcam Pro, Nest Cam boasts improved resolution and a sleeker design. The Nest app provides everything you need to manage the camera. Once you select your camera from the home screen, you’ll see your live video feed. From this screen you can turn the camera on and off, activate the mic, pinch-and-zoom in on a specific area, and view your history of motion events. From the settings menu you can change the video resolution, turn alerts on an off, and schedule the camera to automatically turn off a specified times or just when you’re home. If you have Nest Aware account, this is also where you’ll be able to set your activity zones, create video clips and use other advanced functions. You can also control these features from the Nest web client. Motion detection was pretty sharp in my tests. When the camera was trained on the center of my living room, the sensor was triggered only if a body—human or non-human—moved. It never sent alerts for incidental motions such as a fluttering curtain or leaves blowing in the breeze outside my patio window. Sound detection was less predictable. While it paid no mind to the air purifier and fan running in my living room—proving Nest’s claim that it learns to filter our unremarkable noise—it also didn’t react to a loud hand-clap or to me moving items around on a table. But it was triggered by a cough. I found the app could be a bit buggy at times. Frequently when switching back to the live feed from from another screen, it wouldn’t show an image or I’d get a message saying the camera wasn’t connected, even though it was. Each time the issue resolved itself within several seconds, but it could be disconcerting if you get notified of a real-life event and just want to see what’s going on at home as quickly as possible. More potentially troubling is the 30-minute delay between notifications. Nest says this is by design, to prevent customers from being overwhelmed. While I certainly appreciated not being bombarded with alerts every time my dog or cat walked in front of the camera, it did raise the question of what would happen if, say, pet movement triggered a notification, and then moments later someone broke in to the house. Admittedly, this is a pretty unlikely scenario, but still it seems like notification intervals of every 10 to 15 minutes would be more prudent, if only for peace of mind. If you’re already using Dropcam Pro, Nest Cam’s improvements probably aren’t significant enough to warrant an upgrade. Viewed on a smartphone screen or on the web, the difference between 720p and 1080p is barely noticeable, particularly on surveillance footage. If you’re looking to buy your first Wi-Fi security camera, however, Nest Cam’s sleek, sturdy design; impressive video quality; and easy-to-use app place it near the top of the heap. If you also own a Nest Learning Thermostat and a Nest Protect smoke and carbon-monoxide detector, deploying a Nest Cam lets you integrate all three devices. The Nest Cam can relay a message to the thermostat that you’ve arrived home before you walk past the thermostat’s motion detector, for instance. And if the smoke alarm goes off, it can trigger the camera to snap a picture that might identify the source of the flames. Just bear in mind that without the features a Nest Aware subscription brings, the Nest Cam is little more than a webcam. The subscription adds substantially to the cost of ownership, but it’s a worthy investment if you’re serious about home security.